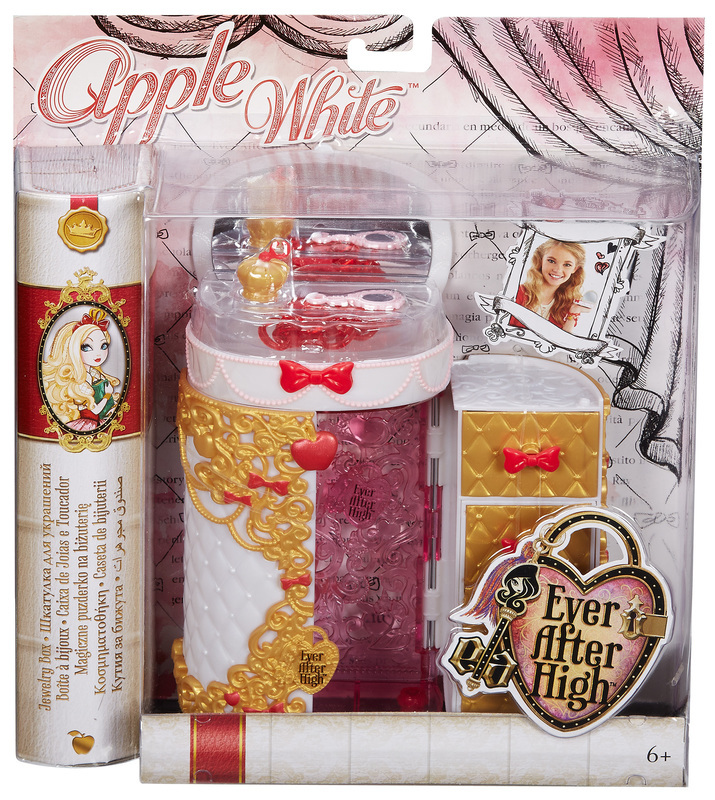 Shut the storybooks of old and open a new chapter with Ever After High, where the teenage sons and daughters of famous fairytales decide whether or not to follow in their parents’ fabled footsteps. Apple White and Raven Queen find themselves on different sides of the destiny debate, but they both have fableous fairytale style! Now, girls can bring that style into their rooms and their accessories with a choice of two jewelry boxes -- one designed with signature Raven style and the other with iconic Apple White inspiration. 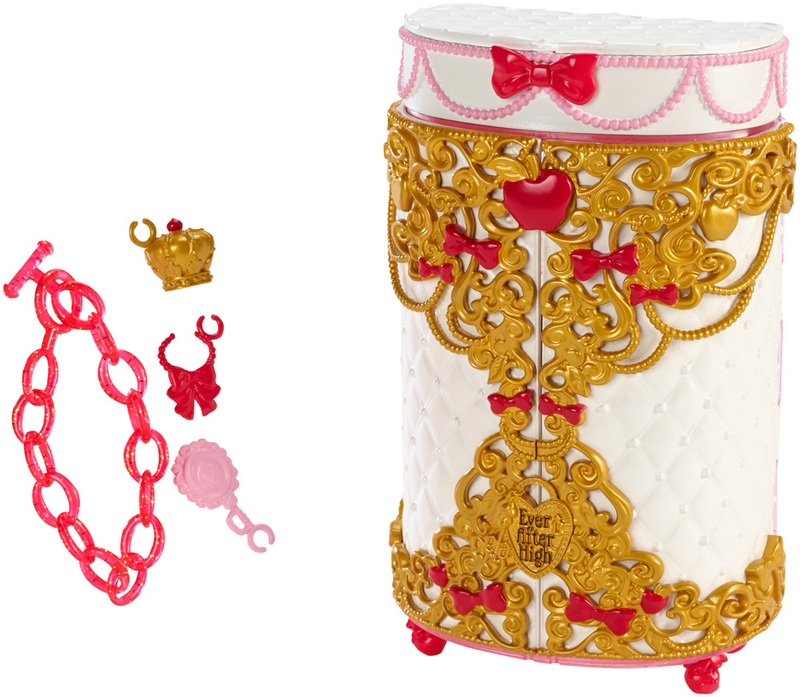 Decorated in pink, gold and red, the Apple White jewelry box is totally hexquisite with signature pearly quilting, pretty bows and red apples. The box opens to reveal to red apple pegs on which girls can hang the included charm bracelet as well as their own jewelry. 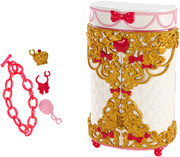 The box also comes with three iconic charms: a pink bow, golden crown and tiny hand mirror. Three working drawers fill the opposite side of the box -- and the bottom drawers can pull out to become a chair for a doll (sold separately)! For fun outside the box, the mirror at the top detaches to become a portable compact! 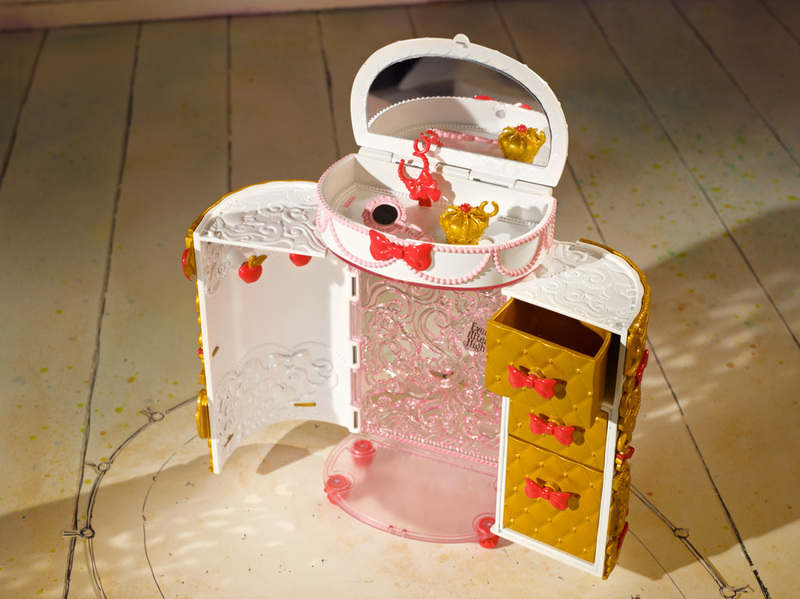 Girls will love being able to store their jewelry and treasured keepsakes in this fashionable, functional and fairytale jewelry box. 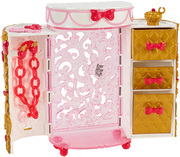 Includes jewelry box with take-away compact, pegs and working drawers, plus one charm bracelet with three removable charms; doll not included. Dolls and jewelry boxes each sold separately, subject to availability. Colors and decorations may vary. 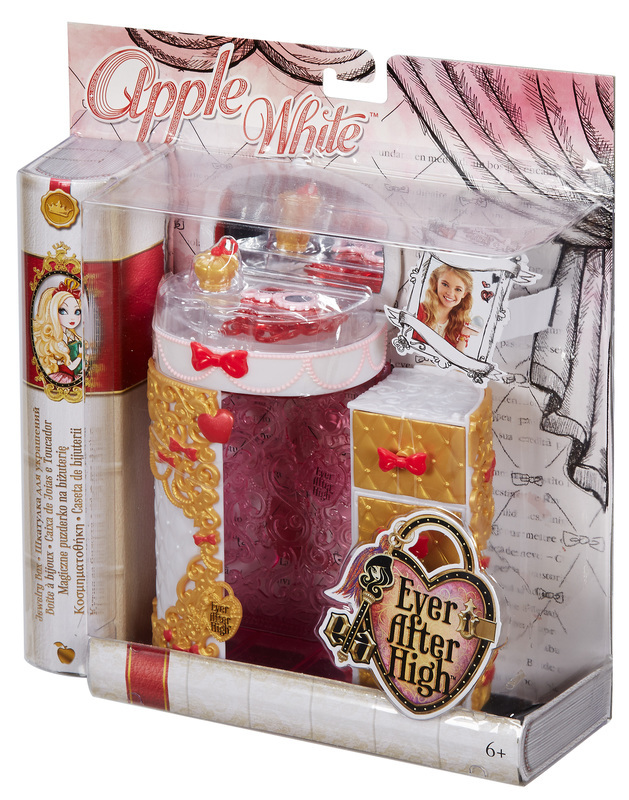 Now, girls can bring the style of Apple White, the daughter of Snow White, into their rooms with this hexquisite jewelry box. Done in her signature style, the Apple White jewelry box is charming, designed with signature pearly quilting, pretty bows and red apple details. Two red apple pegs on one side and three drawers on another can hold favorite jewelry pieces. A charm link bracelet with three removable iconic charms -- a pink bow, golden crown and tiny hand mirror -- is included. The mirror at the top detaches to become a portable compact for girls! Pull out the bottom drawer to create a chair for a doll (sold separately).